Hearing loss is a chronic or long-term degradation in one’s ability to hear sounds. It can range from mild to profound, and it may be temporary or permanent. 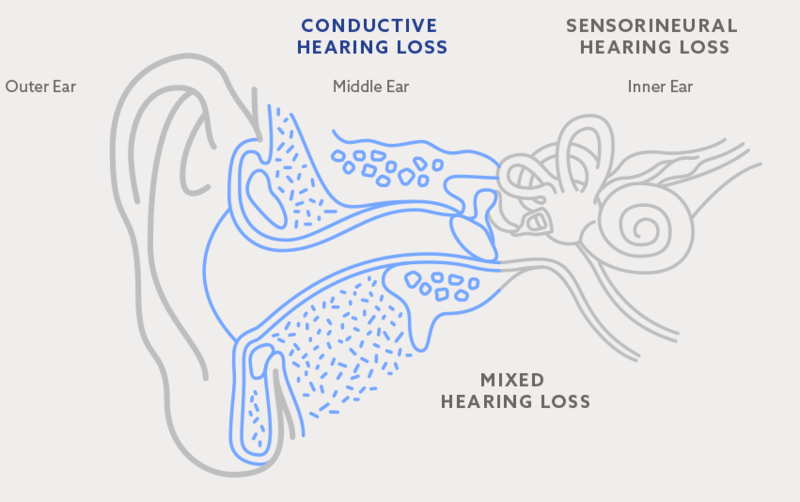 Conductive loss occurs when sound is not conducted through the outer ear canal to the eardrum and the tiny bones of the middle ear. It is noted by a decrease in sound level, or the ability to hear faint sounds. This type of loss is often the result of fluid in the ear from colds & allergies, earwax, or even an ear infection, and can often be medically or surgically corrected. Should these treatments not improve one’s hearing, hearing aids can be used. Sensorineural loss occurs when the nerve pathways from the inner ear to the brain are damaged. It can be caused by diseases, medications, genetic disorders, noise, aging, and traumatic injury. There is no way to medically or surgically correct sensorineural loss. It is a permanent condition. A combination of conductive & sensorineural loss is referred to as a mixed loss. In other words, there may be damage within the outer or middle ear, as well as the inner ear or auditory nerve. 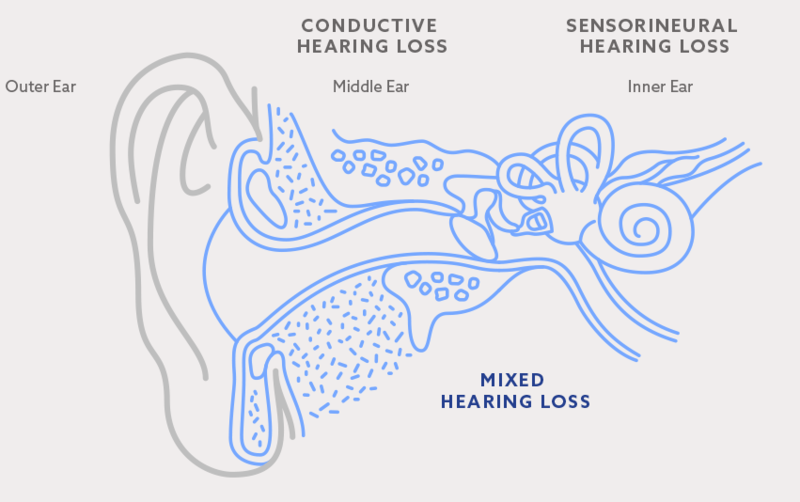 This damage cannot be reversed medically; however, well-fitted hearing aids can improve the quality of one’s hearing. Hearing loss that occurs at high frequencies is considered a “high-frequency loss.” It includes insufficient hearing at the higher frequencies & adequate or acceptable hearing at the lower frequencies. The exact opposite can be said for someone experiencing poor hearing at lower frequencies. Some configurations are flat, indicating similar hearing loss for low and high tones. Unable to hear soft sounds, difficulty understanding speech clearly in noisy environments. Unable to hear soft and moderately loud sounds, considerable difficulty understanding speech, particularly with background noise. Loud sounds are audible but communication without a hearing instrument is impossible. Some extremely loud sounds are audible, but communication without a hearing instrument is impossible. The most common contributor to hearing loss is noise. Exposure to loud sounds at work, driving with your windows down, and even noisy restaurants can cause hearing loss. Over time, this damage becomes irreversible. Age is another common factor affecting individuals with hearing loss. As we age, hearing loss is inevitable due to decreased function of neurons in the auditory system and decreases in hearing sensitivity. Typical problems in the outer ear include excessive build-up of earwax and/or infection of the auditory canal. The most common causes of hearing loss in the middle ear consist of ruptures in the eardrum, infection, and otosclerosis, which cause limited mobility of the stapes due to calcification. Inner ear challenges result from the natural aging process, exposure to noise, certain medications, and head injuries. In such cases, the tiny hair cells in the cochlea are damaged, impeding the flow of sound signals to the brain. I might have a Hearing Loss? 1. Do people seem to mumble or speak in a softer voice than they used to? 2. Do you feel tired or irritated after a long conversation? 3. Do you sometimes miss key words in a sentence, or frequently need to ask people to repeat themselves? 4. When you are in a group or in a crowded restaurant, is it difficult to follow the conversation? 5. When you are with other people, does background noise bother you? 6. Do you often need to turn up the volume on your TV or radio? 7. Do you find it difficult to hear the doorbell or the telephone ring? 8. Is carrying on a telephone conversation difficult? 9. Do you find it difficult to pinpoint where an object is (e.g., an alarm clock or a telephone) from the noise it makes? 10. Has someone close to you mentioned that you might have a problem with your hearing? If you answered yes to more than three of these questions, we encourage you to have your hearing evaluated. Livingston clinicians are professionally trained and perform the most comprehensive assessments in the industry. Scheduling an appointment is the logical next step toward hearing health. Simply call the Livingston location nearest you or select the Request an Appointment tab on our website, and you will be well on your way. The Location Finder tab on our website will point you in the right direction! The majority of hearing losses are attributed to aging. Other possible causes include prolonged exposure to loud noises, heredity, certain illnesses, and medications. The most common form of hearing loss is referred to as “nerve deafness.” This condition results when the cochlea (inner ear) and auditory nerves improperly transmit signals to the brain. While each hearing loss is unique, most people share common experiences as a consequence of their loss. Individuals affected by hearing loss often feel isolated from their surroundings, experience difficulty meeting new people or facing new surroundings, and often complain of appearing incompetent or feeling insecure. I think I might need hearing aids. What should I do? I’m not pleased with the hearing aids I have. What should I do? You might be surprised to learn that many Americans have purchased hearing aids but don’t currently use them. Some people report that their devices don’t work well, or are uncomfortable. Others state they feel embarrassed about their appearance when wearing hearing aids. Whatever the reason, if you currently have hearing aids, but you’re not satisfied with them, we invite you to experience the very latest in technological innovations in hearing health, ranging from completely invisible devices to fully rechargeable instruments. Today, hearing enhancement is smaller, more advanced, more comfortable, and more affordable than ever before. To request an appointment, call the Livingston location nearest you or select the Request an Appointment tab on our website, and you will be well on your way. The Location Finder tab on our website will point you in the right direction! Will my hearing aid amplify loud sounds and damage my hearing further? Your hearing aid will be preset to a safe level of maximum amplification. However, keep in mind that you may have to adjust to loud, and possibly startling sounds which are amplified by your hearing aid. HEARING AIDS THAT LOOK EXACTLY THE SAME CAN HAVE DIFFERENT PURCHASE PRICES. WHY ARE THE PRICES DIFFERENT? 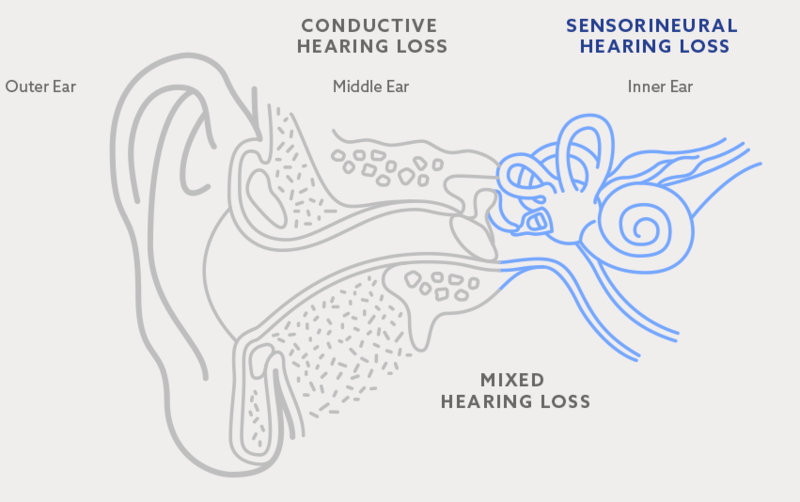 Hearing aids can look alike on the exterior, but the interior circuitry determines pricing. The least expensive circuits are Classes A, B, D, and H. Moderately priced hearing aids are referred to as Entry Level and Basic. Advanced and Premium represent the most expensive circuits. Consider this example: automobiles can look quite similar, but within each body style the consumer has a choice of 4-, 6-, or 8-cylinder or hybrid engines, and a variety of sound packages, interiors, and wheel covers. Although the exterior of two same-model cars may look alike, they can be priced differently. The same is true for hearing devices.